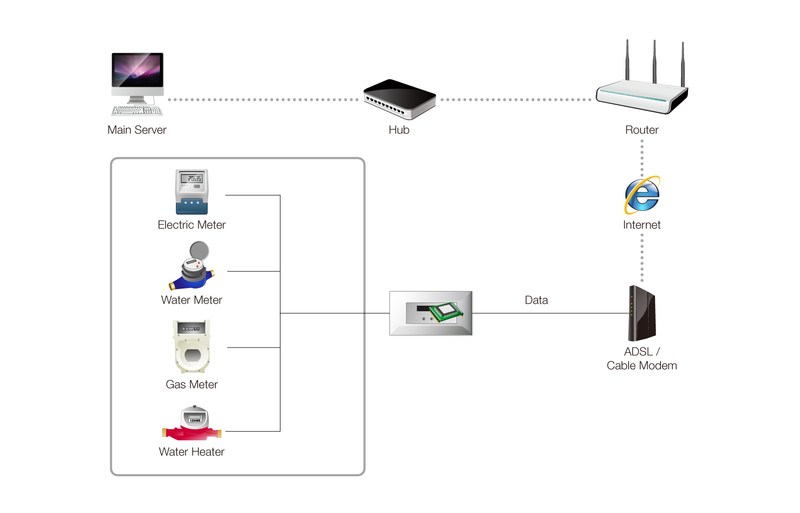 Automatic meter reading is a technology of automatically collecting consumption, diagnostic, and status data from water meter or energy metering devices and transferring that data to a central database for billing, troubleshooting, and analyzing. This technology mainly saves utility providers the expense of periodic trips to each physical location to read a meter. Another advantage is that billing can be based on near real-time consumption rather than on estimates based on past or predicted consumption. This timely information coupled with analysis can help both utility providers and customers better control the use and production of electric energy, gas usage, or water consumption. Sollae Systems’ products add network capability to electricity, gas, and water meters for integrated management of a central server. With Sollae Systems’ serial Ethernet device server, you can easily set up an automatic remote meter reading system by adding network capabilities to electricity, water and gas meters, generally interfaced with RS232/RS422/RS485. It helps those digital meters to connect to the network in order to remotely monitor energy usage at home and workplace from the central server. Since energy consumption status is managed at specific time intervals, accurate and cost-effective meter reading is feasible; no more physical meter readings are necessary. With Sollae Systems’ serial WLAN device server, general users are also allowed to check their energy usage with mobiles in real-time, leading them to recognize overuse of energy and develop energy saving habits in a better way.